Preheat oven to 220°C/430°F. Halve Brussels sprouts and add to a bowl. Add most of the sesame oil, season with salt, and stir to combine. Transfer to a baking sheet and bake for approx. 20 min. In the meantime peel and finely chop garlic and ginger. Finely chop dried chilis and slice mint into thin strips. Roast sesame seeds in a frying pan until they are fragrant and golden brown. Heat remaining sesame oil in a small pot. Add ginger and garlic and fry over medium heat for approx. 2 – 3 min. Add chili paste and keep frying for approx. 2 min. Add dried chilis, sugar, soy sauce, mirin, and rice vinegar and let the mixture simmer until thickened. Remove from heat and let cool down. 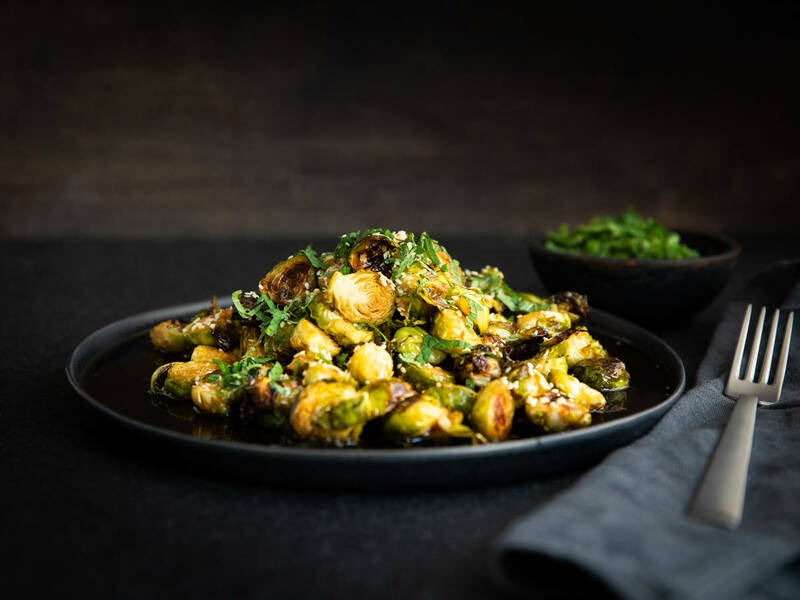 Add roasted Brussel sprouts and marinade to a large bowl and toss to coat. Sprinkle with roasted sesame seeds and fresh mint. Enjoy!